Rakhi Kumar is a Senior Managing Director and Head of ESG Investments and Asset Stewardship at State Street Global Advisors. She leads SSGA's efforts to strengthen integration of environmental, social and governance (ESG) factors into the investment process and is responsible for developing the firm's ESG investment philosophy and global business strategy. Rakhi also oversees all of SSGA's proxy voting and engagement activities and is responsible for developing SSGA's thought leadership and voting guidelines in this area. Prior to joining SSgA, Rakhi worked at the Proxy Governance, Inc., Institute of International Finance, Moody's Investors Service and Booz Allen, among other organizations. 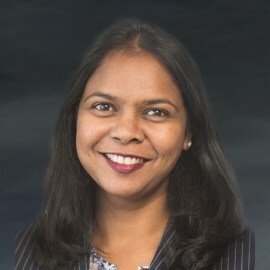 In 2017, Rakhi was honored with the Abigail Adams Award by the Massachusetts Women's Political Caucus and was named on the Ten to Watch list of innovators and influencers in 2018 by wealthmanagement.com and on the Power50: Newsmakers list by the Boston Business Journal for her efforts to enhance gender diversity on company boards. Also in 2018, Rakhi was named to the Boston’s Most 100 Influential People of Color by the Greater Boston Chamber of Commerce, The Boston Foundation and Get Konnected!